areata (patchy hair losson your head). totalis (complete hair loss on your head). universalis (the loss of all body hair). Alopecia is not contagious. It occurs in men, women, and children of all ages. However, it is more common in children and adults in their early 20s. The main symptom of alopecia areata is hair loss that occurs in small, round patches on your head. This leaves smooth, peach-colored areas of scalp exposed. A mild case of alopecia areata starts with one to two coin-size hairless patches. In many instances, it stops after that. Sometimes, the hair will grow back. However, there’s no guarantee. The condition is unpredictable, and the cycle of hair loss and regrowth can repeat itself. Alopecia areata can grow into another form of alopecia. In its worst form, alopecia universalis causes you to lose all body hair. This includes eyebrows, eyelashes, arms, legs, underarms, pubic, and chest and back hair for men. Rarely, people who have alopecia may feel burning or itching in the areas where they once had hair. Some people with alopecia areata see changes in their fingernails and toenails. Nails can have tiny dents (pitting), have white spots or lines, and be rough. There is no known cause for alopecia areata. It is an autoimmune disease. This means your immune system attacks part of your body by mistake. Scientists think the cause of the disease may be related to a person’s genes. In that case, they believe a virus or something in your environment may trigger the disease. See your doctor if you are experiencing significant hair loss. There are many reasons for hair loss. Your doctor will look at your hair loss pattern. He or she will review your medical history. They will check to see if the hairless areas of your scalp are smooth and peach-colored. Sometimes, the remaining hair in alopecia areata has a specific shape. Your doctor may pull a couple of hairs from your head to examine under a microscope. If your doctor can’t confirm a diagnosis, he may send you to a lab for a test. They will scrape a small sample of skin from your scalp and look at it under a microscope. This can help them rule out other conditions that cause hair loss. You may also have a blood test to look for other autoimmune diseases. Can alopecia areata be prevented or avoided? The condition cannot be prevented or avoided. The cause is unknown and varies by person. Alopecia areata is not tied to stress, as some people believe. Some people have a family history of alopecia areata. Having a family member with alopecia areata and another immune system disease can raise your risk of having it. Other immune system diseases include type 1 diabetes, rheumatoid arthritis, thyroid disease, lupus, Addison’s disease, and atopic dermatitis. It is rare for a parent to pass the condition onto a child. There is no cure for alopecia areata. 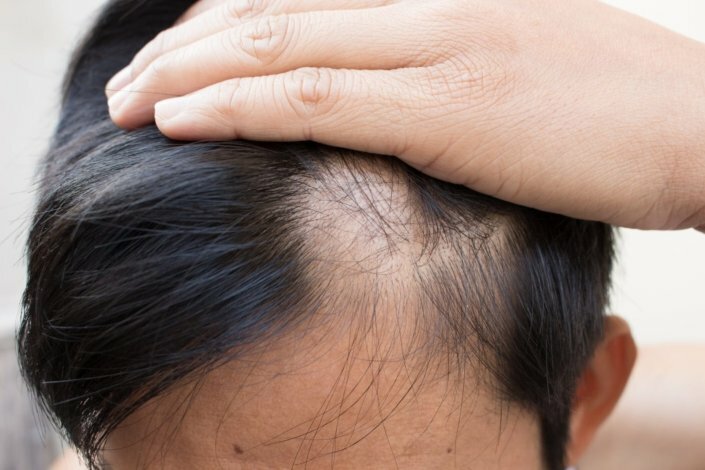 If you have a few, small patches of hair loss on your head, it’s likely your hair will grow back within a few months. Your doctor may not prescribe treatment in those cases. For larger areas of hair loss, your doctor may prescribe steroid injections under your scalp. This could help regrow your hair. Other treatments include hair growth medicines that contain steroids that you apply to your skin. Contact immunotherapy is another treatment. It purposely causes an allergic reaction on your scalp that could trigger hair growth. With this treatment, the medicine that is applied to your scalp irritates your skin, making it red and scaly. It could take as long as three months to see hair growth if this treatment works. Contact immunotherapy does have side effects, including a severe rash and swollen lymph nodes in your neck. No matter what therapy you try, hair loss usually returns when you stop treatment. The American Academy of Family Physicians (AAFP) recognizes that living with alopecia areata can be emotionally difficult. It affects social interaction and self-confidence, as people are embarrassed to let others see their hair loss. It can also be frustrating to not know if your hair is going to grow back or fall out again. Consider joining a patient support group for people who have alopecia areata. Support groups give you a chance to talk about your condition. They help you realize you are not alone in your frustration with alopecia areata. A support group can be a good resource for practical tips to deal with the condition. Hairstyling techniques or hair care products can help to cover bare patches on your head. But some products can be harsh on your hair. This could cause additional damage and loss. You might want to talk with your doctor about what products to avoid. People who have alopecia areata are encouraged to be creative with hats, scarves, and wigs. Losing your eyelashes, eyebrows, and the hair in your nose and ears also can be a problem. Hair protects your eyes, nose, and ears from the irritation of dust, germs, and small, foreign particles. Wear eyeglasses or sunglasses to protect your eyes. You can use antibiotic ointment inside your nose to help keep germs out. Be sure to cover areas of exposed scalp with a hat or sunscreen to reduce your risk of sunburn and skin cancer. How much hair do I need to lose before calling my doctor? If one of my parents has alopecia areata, is there a genetics test I can take to determine if I will get it? If my hair loss has lasted more than a year, what are the chances it will return? Do certain diseases put people at risk for developing alopecia areata?